Guess what’s getting a reboot? 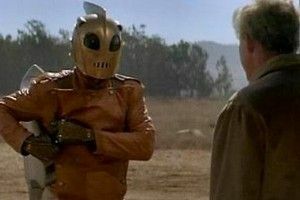 Why, it’s little-remembered 1991 adventure movie The Rocketeer! Vulture reports that Disney is looking for a second crack at the flick, which starred Billy Campbell — last seen running for mayor of Seattle, with some slight complications, in The Killing — as a pilot who accidentally steals a jet pack from some gangsters and quickly turns to crime-fighting and girl-saving. As Vulture also points out, this thing bears some similarities to the flying suited hero of Iron Man fame, which has found its fair share of success with Disney’s Marvel branch. So was it Robert Downey Jr.’s oceans of charms and the years of groundwork laid down by Ghostface Killah that catapulted the Iron Man franchise into billion-dollar success? Or can movie audiences simply not get enough of people with homemade flying contraptions? It’ll be a little while until we find out conclusively, as the project is just going to writers now. or tomorrow”; also, everyone has thin mustaches. And the special effects! No, they don’t hold up, they’re terrible. But terrible in a very pleasing way! Plus, think about it: If super-random movies like The Rocketeer can get reboots, that means almost anything might be next. Hey, look, maybe one of your own late-night adolescence cable favorite will be next. We’re talking rejuvenation here. Long-shot comebacks. Second chances. It’s heartwarming stuff.